Anyone who has been following Mastering Your Makeup for any time at all will know that I am mad into my nails. I always get them done, and when I say always I'm talking every two to three weeks without fail for at least the last four years. Two years ago I found Elaine Cahill of Elaine's Beauty in Cabinteely. Elaine uses CND Shellac and always creates little pieces of art for our Disney Series which soon turned into a total habit. During 2017, I heard of this new nail company The Manicure Company. It was by pure chance that at the Waverley Academy awards night, I bumped into two old friends from home in Waterford, David & Lorraine who turned out to be the owners and creators of The Manicure Company. There is only one lady in my blogging life who I know loves nails more than me and that is Anita from Adorn.ie. 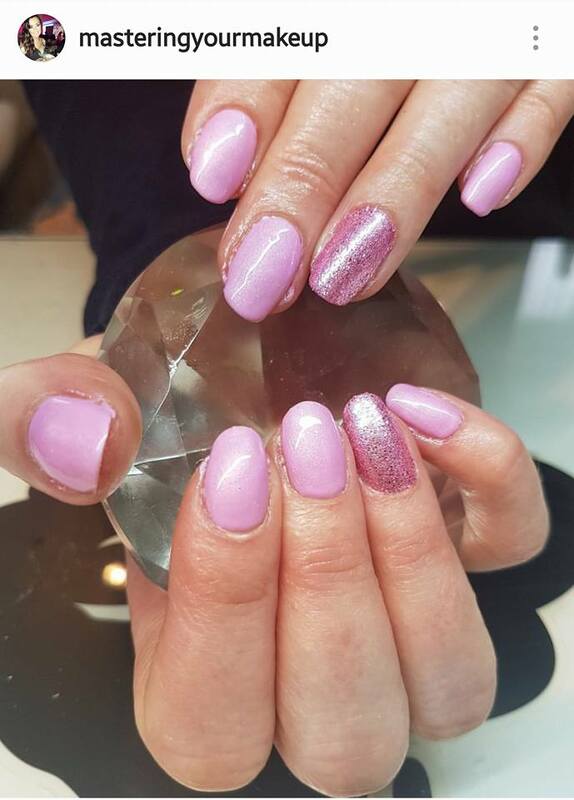 Anita has invested so much time into her training and nails are a huge passion of hers. She was telling me all about the wonderful colours TMC have so she asked if I would like to try them out. I was delighted and it led to four different application just so I could get to try lots of the range. If you are interested in nail art be sure to check out Anita's Instagram page @Adorn.ie She can create amazing effects I even asked her the other day about one nail on her demo wheel and she was able to tell me she has a spray gun for nails.... a spray gun, I had never heard anything like this. So back to TMC, the first colour I had to try was this bright pink with a pink glitter nail. The shades were Sash-Ay & Princess Glitz Addition. I absolutely loved them! I couldn't stop looking at them, I was dying to get some tan on just so they would stand out more. Myself and Anita decided to leave them for 3 weeks to see just how tough the polish was against my daily life. Sometimes when my nails are longer they don't hold polish as good as they should. Unfortunately that is what happened by week 3 of these shades. I wasn't too surprised or too disappointed but I decided with Anita we would only leave the nails two weeks in between colours. This made a massive difference to my nails. Anitas prep of the nails is completely by the book so I felt it was my lifestyle and growth that affected the nails ability to stay perfect. Once we shortened my nails and then changed the colour every two weeks, it almost felt cruel taking off the previous shades as they were 100% perfect. The second set having just had one colour before we went mad and put five different colours on my nails. We went for an autumnal look with glitter of course. These shades were Smoked,Winter Rose,Girl Boss,Bronze Bronze Baby &Arm Kandy. I loved this look and so many people commented on the colour combo they were really beautiful. Our third set was in suporrt of my home county. Waterford had made the All Ireland final and it came at the perfect time as I also discovered the shade Periwinkle Portrait. This blue is just stunning, it is so bright and with tan just bounces off your fingers. We did add a glitter which is not from TMC but it made for an amazing addition to the look. It was from Akzentz Gels UK and I think every nail lover needs to have this on their nails at some point, its hard to go back to any glitter after you've had this on your fingers! For our final look, I was really confused over what I wanted. I had an idea to have a really deep wine colour and wanted a wine glitter to match it. 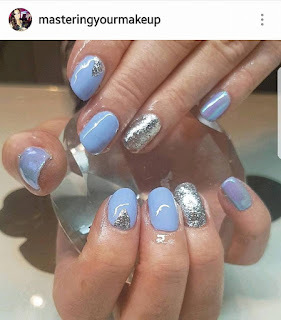 I find all my inspiration for nails from Pinterest, my nail board is currently huge and I just wish I had the skill and ability to do my own nails the way Anita can do them. I am also totally jealous of her polish collection, I'd have to change my nails all the time if I had that many colours. 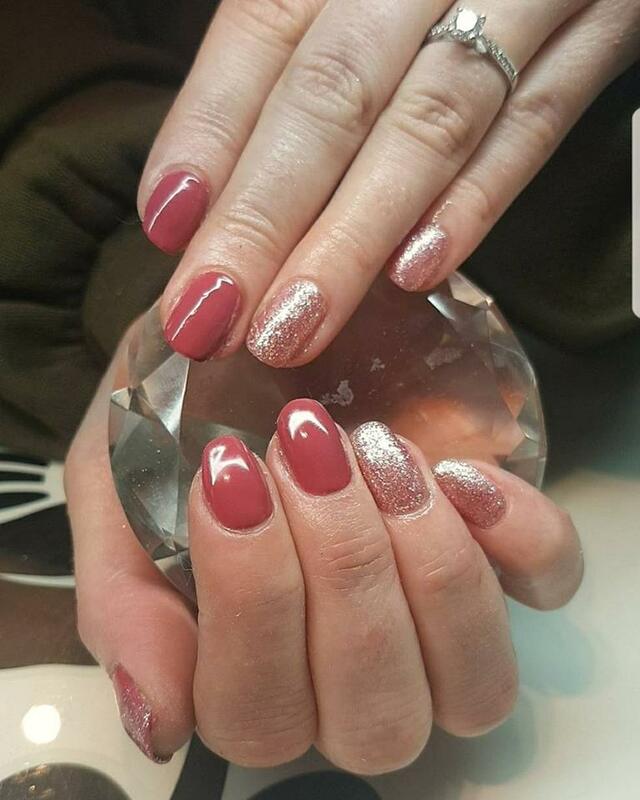 We went for another autumn look with a stunning rose gold glitter called Goddess (Anita tells me I am a magpie and she's totally right, I cannot have plain nails, I need glitter in there somewhere!) So this time we matched the shade Smoked with it. 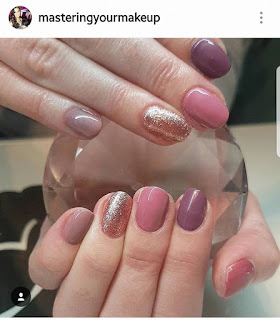 Overall I have loved having my nails done using the shades from TMC. I am not sure of the base coat, I know we mixed and matched different base coats to ensure the safety of my nails. As I am not a nail tech myself, I can only judge my fingers as I see them with the wear and tear and for me, the nails didn't last the three weeks but two was plenty of times. I think the shades the company have brought out are stunning. I know that Anita follows the new releases and recently purchased the Decadence collection, the new autumn shades but when we went to look for those darker shades I mentioned earlier, they just haven't brought them out yet. I imagine with Christmas coming these will be the shades next on TMC's list but I was surprised that the real winter look I wanted to create wasn't possible at the moment. I look forward to seeing what new shades TMC bring out for Christmas. If you are interested in this brand, they are very active on Instagram sharing all the pics Nail Artists tag them in so you can see the range of colours. 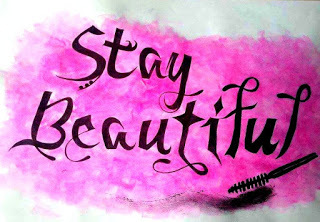 I just want to say a massive thanks to Anita for inviting me to try out the colours. She is a truly gifted lady who's passion is so clear from her work. It was an itch I just had to scratch and given the range of bright colours and amazing glitters, I will deffo be back to this brand and will deffo support the homegrown hero company from Waterford.